Windows 10 October 2018 Update is not popular amongst Windows 10 user. About 80% of the Windows 10 users appears to rather wait for an upcoming large update of Microsoft’s latest operating system. According to numbers released by advertising company AdDuplex, only 12.4 % of all Windows 10 has upgraded to Windows 10 October 2018 Update (build 1809). The predecessor of that version, Windows 10 build 1803, is much more popular and is installed on 80.2% of all Windows 10 systems. 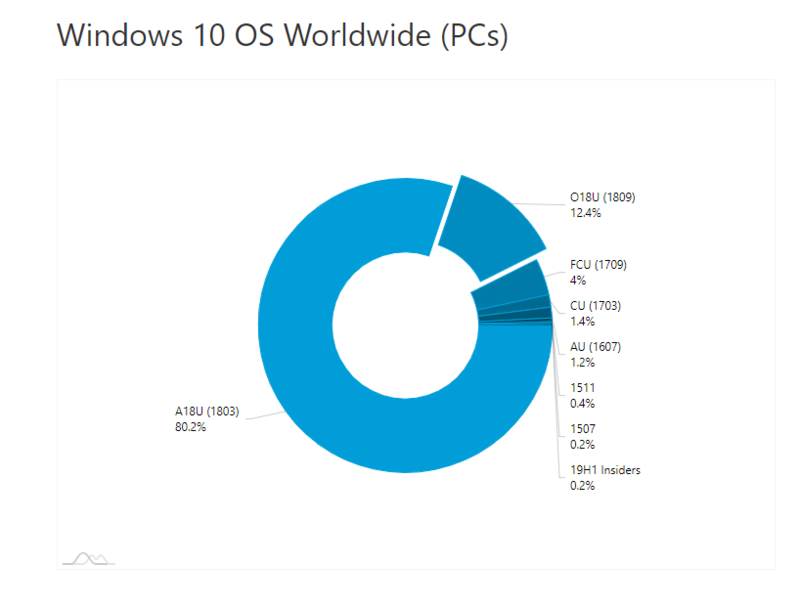 The remaining 7% of Windows 10 computers runs an older version than Windows 10 build 1803, and 0.2% are Windows Insiders who have already installed the currently beta tested Windows 10 19H1 version. The numbers are a clear sign of loss of confidence in the October 2018 Update. Initially, the large October Update was planned for autumn 2018. But because it was right from the start plagued by problems, Microsoft had to stop the gradual roll out of the update. Microsoft even had to temporarily withdraw the update after users reported bugs of which some caused them to lose files. Fortunately for Microsoft there is at least something positive about this month’s numbers, the number of computers running the October 2018 Update has doubled compared to last month. Nevertheless, the numbers are disappointing. In April 2019, Microsoft has a chance of winning back the trust of its users. For that month, the next large update to Windows 10 is planned. This update should bring new features as Windows Sandbox, a feature that reserves sufficient storage capacity so that Windows 10 can always be updated and many other small bug fixes and changes.